(AP) -- Atlantis' astronauts checked their ship's flight systems and packed up Thursday in hopes of an on-time end to their triumphant Hubble Space Telescope repair mission, although the weather prospects were dismal. Thunderstorms pounded NASA's spaceport throughout the morning, and more bad weather was expected Friday when Atlantis was due to return home. The rain did not dampen NASA's jubilation over the crew's impressive Hubble repairs, which garnered presidential kudos. On Thursday afternoon, the astronauts were slated to testify before a Senate panel, all the way from orbit. The subject was NASA's budget. 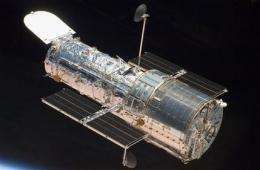 "You have left Hubble much better than you found it, so now it is time to think about heading home," Mission Control said in a morning message. "We are all looking forward to seeing you back here on Earth." Commander Scott Altman aimed for a Friday morning touchdown at Kennedy Space Center, but given the poor weather reports, he and his crew were conserving power in order to remain aloft until Monday, if necessary. Mission Control warned the astronauts that Friday's weather would be "iffy." "We flew over today, saw it looked kind of nasty at the moment, but saw some clearing behind it - maybe," Altman radioed down. "As long as you think there's a chance, we'll be willing to do whatever it takes." Atlantis and the seven astronauts rocketed away on NASA's last visit to Hubble on May 11. In five back-to-back spacewalks, the astronauts installed two top-of-the-line science instruments and replaced burned-out electronics in two other science scopes. They also gave the 19-year-old observatory a new computer for sending back science data, freshened up the power and pointing systems, and beefed up the exterior with steel foil sheets. The refurbished Hubble is expected to perform better than ever over the next five to 10 years and probe even deeper into the universe, as far back in time as 500 million to 600 million years from creation. Besides watching the weather, NASA kept shuttle Endeavour poised for a possible liftoff, in the unlikely event Atlantis suffers some sort of damage or breakdown before heading home. The rescue mission was put in place long ago to minimize the risk the Hubble repair crew was taking. The Atlantis astronauts had to launch into a 350-mile-high orbit to get to Hubble and had nowhere to go in the event their ship was damaged seriously by liftoff debris or space junk, a bigger problem than usual so high up. The international space station is in a different orbit and unreachable. On Thursday, NASA said an extensive survey of Atlantis' vulnerable wings and nose showed no evidence of worrisome trouble, and managers cleared the shuttle for re-entry. A hole the size of a dinner plate, in the left wing, brought Columbia down in 2003.